Just because you don’t make a lot of money does not mean you will not qualify for a mortgage. Thanks to many low income home loans available today, you can be a homeowner. In this article, my goal is to give you all the tools you need to find, apply for, and successfully close on a mortgage loan despite having a low income. These loans will give you hope that you can buy a home without saving 10% to 20% of the home’s price for a down payment. And more important, hope that you can afford the monthly payment once you move in. 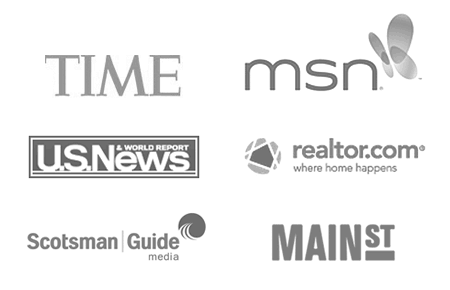 Click here to see if you are eligible to buy a home. Just like any task worth undertaking, finding the right home loan for a lower budget is a process. Discovering these low income home loan types might be just the first step. See Part 2 of this article about how lenders decide whether you’re approved for the loan. Your next steps may be to work on your credit or savings habits to make your loan app look that much better. For now, let’s get right to the specific home loan programs. Building a house takes a well-stocked tool belt, and so does buying one. Here are some of the best low income mortgage options. 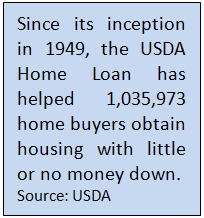 The USDA loan lets you buy a home with zero down payment. It’s available for properties in areas the USDA designates as rural, although many eligible areas are quite suburban. To check out eligible areas, see USDA’s property eligibility map. This program is also called the Rural Development loan or USDA Guaranteed Loan program. It has been fantastic home loan for low income families over the years. You can buy a home at a low interest rate with little or nothing out of your pocket. People who don’t already own an adequate home. Those who make 115% or less of the area’s median income. Click here to check your USDA home loan eligibility. This program is set up specifically as a home loan for low income families. Also known as Section 502 loans, they are available to individuals with very low and low incomes, defined as 50% to 80% of the area’s median income. You can have a 33 year term, or even a 38 year term in some cases. And, payment subsidies are available for those who don’t qualify for the full payment. To see if your income is within limits, see USDA’s Direct Loan income limits page. Keep in mind that standard home loan lenders do not offer this program. You have to apply through USDA directly. Your income must be too low for other loan programs to be eligible. You have to make sure you don’t qualify for a standard USDA loan before you apply for a USDA direct loan. Speak to a USDA loan professional about standard USDA financing by completing a short questionnaire here. The 3.5% down payment can come from down payment gift money. FHA has more lenient debt ratio requirements than conventional financing, meaning you might qualify with a lower income. FHA does not require you to have extra money in the bank after closing the loan. You can use a co-signer (another party who contributes to the loan repayment but won’t live in the home). FHA is designed with low income families in mind. It has helped millions break into home ownership despite traditional barriers. Click here to see if you qualify for an FHA loan now. An FHA 203k loan is basically an FHA loan with an added feature: the ability to finance the purchase price and rehab costs into the mortgage. This loan program is one of the best low income home loans because it lets take advantage of lower prices on fixer-uppers. At the end of this article, I talk about how the lender makes sure the property meets minimum standards. Well, with an FHA 203k, that doesn’t matter. You finance the repairs needed to bring it up to FHA’s minimum property requirements. Because homes that don’t meet requirements traditional financing, they are typically steeply discounted. This allows those with a lower income to get into a home more easily. Click here to check your eligibility now. If you have military experience, the VA mortgage should be the first low income mortgage option you check out. It requires zero down payment and the seller can pay all or most of your closing costs. There’s no monthly mortgage insurance which can save you hundreds per month. No mortgage insurance means you can buy more home with less monthly income compared to other loan types. And, VA loans are more lenient on debt ratio and credit score requirements. Many low income individuals and families have used a VA loan to buy their first home. 24 months or the full period for which you were ordered, if now separated from service. If you are eligible, you could be very close to owning your own home despite currently being on a low income. No private mortgage insurance required. This loan could help you buy a fixer upper at a low price. Your monthly payment will fit into your budget much easier than many homes that are in top shape. And no mortgage insurance means a big reduction in your monthly costs. These homes are Fannie Mae-owned foreclosures. Fannie’s goal is to sell these homes to great potential homeowners like you. So, they remove many of the traditional roadblocks to owning a home like PMI and a large down payment. That’s great news for buyers looking for a low income mortgage. Find a list of homes for sale in your area by searching on HomePath.com. Then call an approved HomePath lender here and get started. There’s also an option to purchase and repair the home with a HomePath Renovation loan. You can buy and fix up the property to your liking, using just one loan. See complete HomePath guidelines here and HomePath Renovation guidelines here. The new HomeReady program from Fannie Mae is extremely flexible on sources of income. Applicants can use the income of household members who are not on the loan as a compensating factor. That means a family member who does not want to be on the loan can still help you qualify. In addition, you can use boarder and roommate income, rental income from a basement apartment, and non-occupant co-borrower income to qualify. The down payment requirement is just 3% and can come entirely from a gift or approved down payment assistance program. See if you can buy a home with the HomeReady mortgage program. The Good Neighbor Next Door (GNND) program is a special loan type offered by the US Department of Housing and Urban Development (HUD). It allows law enforcement officers, teachers and emergency personnel to buy homes at a 50% discount! Here’s how it works. You find a home on HUD’s GNND website and make an offer. If more than one person submits an offer, a random lottery is held to see whose offer is accepted. If you are selected, you must prove that you are an approved type of public worker. HUD establishes a “silent second” mortgage for 50% of the listed price. But if you live in the home for a full 3 years, that debt is erased! You can use various types of financing for this program. But if you use FHA, your down payment requirement is only $100. If you meet the above criteria, this is a perfect low income mortgage option. After all, you only have to make payments on 50% of the home’s purchase price. Contact one of our loan professionals here to check interest rates and get started. Manufactured homes represent a large part of available homes in many areas. You can find some really low prices on manufactured homes, commonly called mobile homes. Mobile homes can be a great way to get into a home for much less money upfront and monthly. They don’t appreciate like standard stick-build single family homes, but they can be a great way to break into homeownership. Just be sure that you only look at homes built on or after June 15, 1976. Any mobile home built prior to this date can’t be financed with any traditional loan. Click here to see if you qualify to buy a manufactured home. An FHA loan is the easiest way to finance a mobile home purchase. Standard FHA rules apply, like 3.5% down and lower credit standards, but there are some additional property inspections required. To see complete guidelines on FHA loans for mobile home, check out our blog post or simply click here to see if you qualify to buy a manufactured home. You’d be surprised at how many cities, counties, states, offer down payment assistance to low and moderate income home buyers. In fact, there are too many to list. Down payment assistance, otherwise known as DPA, is a powerful tool for homeownership. It eliminates years of scrimping and saving for a down payment. When you have a low income, it’s tough to save enough to buy a home. HUD distributes funds each year to jurisdictions in all 50 states to help low income home buyers. Eligible buyers must make no more than 80% of the area’s median income. Jurisdictions that administer the funds are too many to list, but you can easily find out if there is a HOME-sponsored program in your area here. DPA funds can be used in combination with many standard loan types. If there is a program in your area, contact a knowledgeable loan officer to see if you can combine down payment assistance with the loan type you’re interested in. Click here to check your homebuying eligibility. Many local governments offer DPA funds to lower income borrowers. Down payment assistance programs revitalizes urban and suburban areas. It encourages families to buy homes, move in, and improve the community. Each program is a little different. Sometimes the down payment assistance is a low income grant that you don’t have to repay. Other DPA programs lend you money at little or no interest, but needs to be repaid eventually. Ask a local real estate agent about down payment assistance programs in your area, and see our page down payment assistance page for more examples of organizations that participate. Some charitable organizations are able to contribute down payment assistance funds toward FHA loans. But, they must be approved by HUD. To see if a non-government organization in your area is approved search by name or location here. Click here to see which down payment assistance programs are available to you. All across the country, there are city-, county-, and state-based grant programs to help low income families to buy a house. And I’m going to tell you how to find them. Housing is getting expensive, especially in major metros. That’s why local governments are getting involved in down payment and closing cost assistance. Many locales can’t bring home prices down in their region. But what they can do is give away money to help families get into homes when they otherwise couldn’t. Unfortunately, there are not many, if any, centralized databases of all these individual grant programs. Each grant has its own rules, dollar amounts, and geographic restrictions. But you can find these programs with something you use all the time anyway: Google. Simply Google your city, state, or county name followed by “housing grant”. In about 3 minutes, I was able to find very good programs in Seattle, Miami, North Dakota, Connecticut, and Clark County, Nevada. Literally every location I Googled had a housing program. Seattle: Up to $55,000 (yes, that much) in down payment assistance to families earning less than 80% of the area median income. North Dakota: Just $500 out of pocket to buy. First-time home buyers who meet income requirements are eligible. Connecticut: Full down payment covered (typically 3-3.5%) via a low-interest loan. Clark County, Nevada: A non-repayable grant of 4% of the loan amount to cover down payment and closing costs. 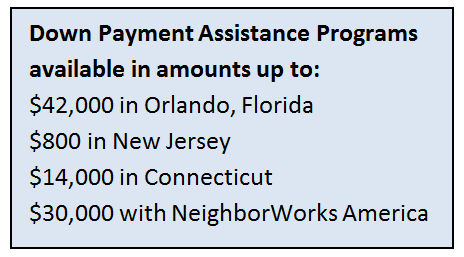 These are just a few of the hundreds of grant programs available across the country for low income families. With just a few minutes of research you could be on your way to homeownership through a grant program. The government wants you to get a low income mortgage. It sounds strange, but really, it’s not. According to the National Association of Home Builders, homeownership makes up about 15% to 18% of the U.S. economy. Without homeowners, economic growth would simply stop. 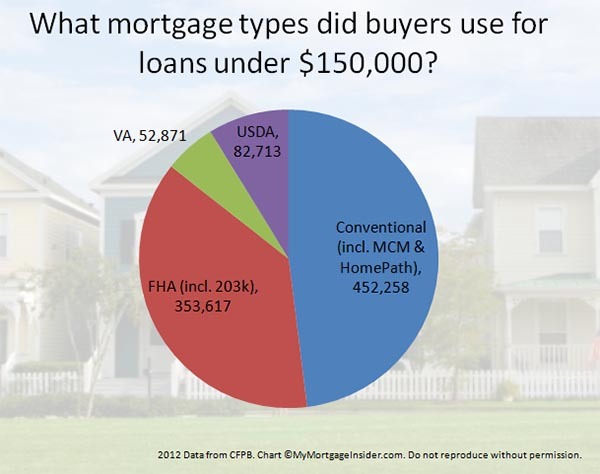 So, the government sponsors a myriad of programs — FHA, USDA, VA loans, plus many conventional programs — that spur homeownership among average and even below average wage earners. Due to these programs, it’s not uncommon for waitresses, factory workers, and even seasonal workers to get low income mortgages. The problem is, many renters continue to rent because they assume they can’t qualify. The don’t realize they can request a pre-approval with a lender, typically for just the cost of a credit report, and the lender might even pick up the tab for that. The point is, a low income mortgage is within reach to many thousands of lower wage earners in cities across the U.S. — but it’s up to them to check their eligibility. Ready to see if you’re eligible? Get started here. When looking for low income mortgage loans, you’ll want to consider the total cost of getting into a home, which includes the down payment plus the loan closing costs. A great way to reduce costs is getting the seller to pay your closing costs. Closing costs can be several thousand dollars which could put a real hamper on your home buying aspirations. Why would the seller pay your closing costs? Because the current owner of the home wants to sell the home, probably almost as much as you want to buy it. Many homeowners or banks (if the home is a foreclosure) give the buyer thousands of dollars to ensure a smooth closing. Work with your real estate agent to go about asking for closing costs properly. You’ll need to ask for the right amount for the situation. If the home you are looking at has multiple offers, they probably won’t accept one that is asking for closing cost help. You may want to look at homes that need work or are in less demand. Sellers are usually more willing to pay closing costs in markets that are still flooded with foreclosures. Closing costs are no fun, but a reality when getting a mortgage, even a mortgages for low income families. If there’s any chance the seller will help, you might as well ask. Click here to check your home buying eligibility status. Now that we’ve reviewed your tools as a low income home buyer, let’s dive in to the basics of getting a mortgage. These are rules that apply to anyone, with any income, getting any type of mortgage. Credit. This is the one area of the loan application where you can really shine even if you have low income. A lender wants to know you’ve been faithful in smaller responsibilities before handing you a big responsibility. It doesn’t matter that your auto loans, credit card limits and such are smaller than those of higher income borrowers. The only thing that matters is that you’ve handled the credit – whatever size – responsibly. A great credit score can raise the dollar amount you qualify for. If you don’t have a great credit score, you may want to work on that first before continuing your homeownership journey. As a low income borrower, you need to have all other aspects of your mortgage application in top shape to get the best home available. Check out our articles and videos on credit here. Employment. The lender will want to see that you have steady employment, even if income from that employment is low at the moment. It looks much better on a mortgage application if you’ve had one job over the past 2+ years rather than many jobs. The lender wants to know that you can hold down a job. It will be your means of repaying your mortgage, after all. If you have had a few jobs over the past few years, work up a great letter explaining why you changed jobs. Did downsizing force you to change jobs? Also, tie each employment experience together, stating how each one relates to the other. A long time in the same line of work looks much better than a long history of unrelated jobs. Debt vs. Income. This is a big one. This could make the difference between you owning a home and continuing to rent. The lender will look at how much debt you have compared to your income. Since your income is low, you want your debt payments to be low as well. That’s $850 per month left for principle, interest, property taxes, HOA dues, and homeowners insurance. But if you had just $50 per month in credit card bills and no other debt, you would have up to $1,300 available for a house payment. That a $100,000 increase in your buying power because of $450 less in monthly debt. In the months and years before buying a home, make a plan to pay off debts. Down Payment. It’s tough to save money. On a tight budget, it’s hard enough to put food on the table. Luckily there are home loans for low income families. Many options don’t require a down payment. I go over these programs in the “Tool Belt” section below. Still, the lender will want to see that you can save money. So even if it’s only $25 per month, see what expenses you can cut out of your budget to put toward a savings account. Property. The lender checks out the property to make sure it meets minimum requirements. You might be tempted to look into a fixer-upper to get a lower purchase price that fits within your budget. That’s fine, just keep in mind that loan approval is tough with a beat up home. Because you’re looking for a low income home loan, it’s very likely that you could be close to maximum debt ratio limits. That’s why it’s a good idea to get a pre-approval from a lender. The pre-approval will tell you your maximum purchase price. Always know this magical number before looking at homes. There’s nothing worse than falling in love with a home that’s out of your price range. 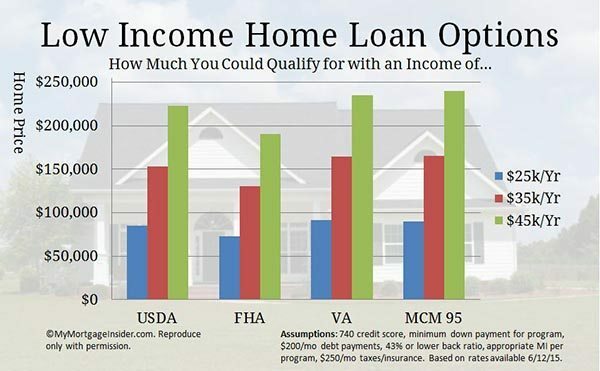 Click here to see if you qualify for a home loan. There are tons of options out there for low-income home buyers. It’s simply a matter of finding the right one. Keep at it. Just because you are denied the first time doesn’t mean you can’t re-apply after you’ve cleaned up your credit, received a raise, or paid off debt. With some perseverance and knowledge, you’ll be in your own home before you know it. Click here to check your eligibility for a low-income home buying program.